Der 1861 in Bozen geborene Ludwig Thuille wirkte als Komponist und Pädagoge der Münchner Schule. Als Waisenkind adoptiert von der Witwe des seinerzeit berühmten Komponisten Matthäus Nagiller, lernte er 1877 den nur drei Jahre jüngeren Richard Strauss kennen, dessen Eltern mit der Familie Nagiller gut bekannt waren. Dies war der Beginn einer innigen Freundschaft, die bis zum frühen Tod Ludwig Thuilles nach einer Herzattacke im Jahr 1907 Bestand haben sollte und die durch die Briefe Strauss' dokumentiert ist. Die beiden Streichquartette dieser CD komponierte Thuille während seiner Studienzeit. Das A-Dur-Quartett (1878) sandte er mit einer Widmung an Richard Strauss, der mit aufrichtiger Rührung reagierte: „Ich entrolle das Papier und – ich glaubte meinen Augen nicht trauen zu dürfen -Quartett für 2 Violinen, Viola und Cello, mir gewidmet! Die Freude, die ich darüber empfand, kannst Du Dir nicht vorstellen […]. Ich fand das Werk exquisit, Melodienreich, sehr schön gesetzt, brillant gemacht, voll Steigerung, herrliche Form.“ Die Einspielung seiner Streichquartette wirft nun ein neues Licht auf diesen vielseitigen, originellen und zu Unrecht vergessenen Komponisten. Born in Bolzano in 1861, Ludwig Thuille worked as composer and teacher of the Münchner Schule, one of the leading musical centres of Europe at the turn of the 20th century. In 1876, Pauline Nagiller, the widow of the then quite popular composer Matthäus Nagiller, invited the now orphaned Ludwig to stay with her in Innsbruck. It was there the following year that he met Richard Strauss, who was three years younger than him and whose parents were acquainted with the Nagiller family. This was the start of a close friendship, which lasted with some interruptions after a quarrel until the early death of Ludwig Thuille, caused by a heart attack in 1907. The friendship is well documented in the letters of Strauss. 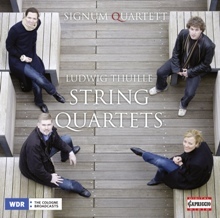 The two string quartets on this CD were written by Thuille during his days as a student. The cover sheet of the A-major quartet informs us that it was composed during the first ten days of February 1878. Together with a dedication Thuille sent the piece to Richard Strauss, who was sincerely touched: “I opened the package and could hardly believe my eyes – the quartet for two violins and cello dedicated to me! You cannot imagine my joy (…). I considered the piece to be exquisite, rich in melody, very well set and brilliantly composed in beautiful form.” This recording of his string quartets casts new light on this many-sided, original and wrongly forgotten composer.